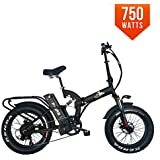 Amazon's Choice for "folding electric bike"
Sold by Amazer Official and ships from Amazon Fulfillment. 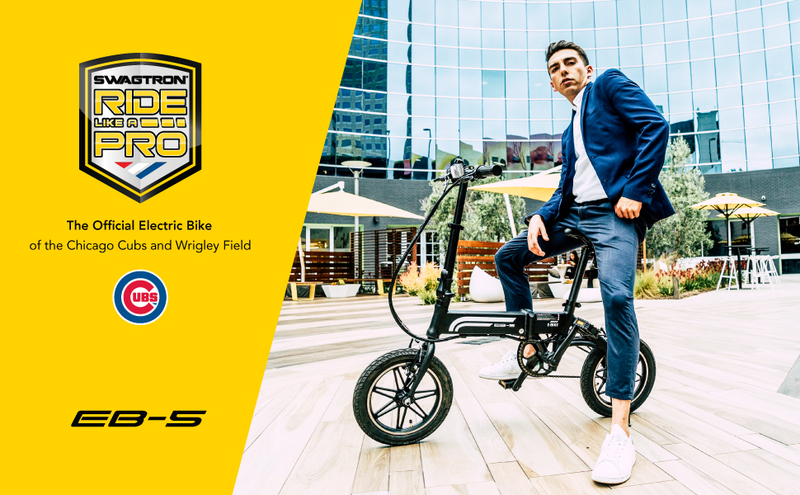 Add a boost of swag to your travels with the EB-5 E-Bike! 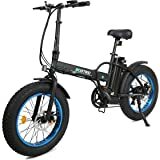 Reinforced with quality materials and a long-lasting battery, this electric bicycle is the answer to revamping your everyday commute. From major cities to country sides, this spectacular e-bike can take you just about anywhere. Twist the throttle and speed just over 15 MPH as you race to class with power assist or break a sweat as you pedal through your morning errands. The EB-5 hybrid bike packs enough punch to last up to 15.5 miles on just power alone or, for even more distance, start pedaling. 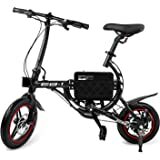 Go full throttle then change to pedaling or switch between the two at intervals for a great workout, with the EB-5 you can ride whenever and however you want. 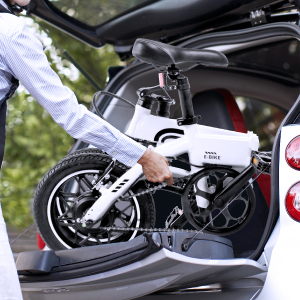 Ultimately, this folding electric bike weighs 37 lbs / 16.8 kg and features a triple-fold design allows for extreme portability. Stow your bicycle inside trunks, subways, closets, or any compact space. Traveling up flights of stairs? Easy! Unlike most hefty adult bikes, the EB-5 E Bike is light enough to accommodate residents living on the fifth floor and travelers always on the go. Grab adventure by the handlebars or enjoy the passenger side of this modern day luxury hybrid bicycle. 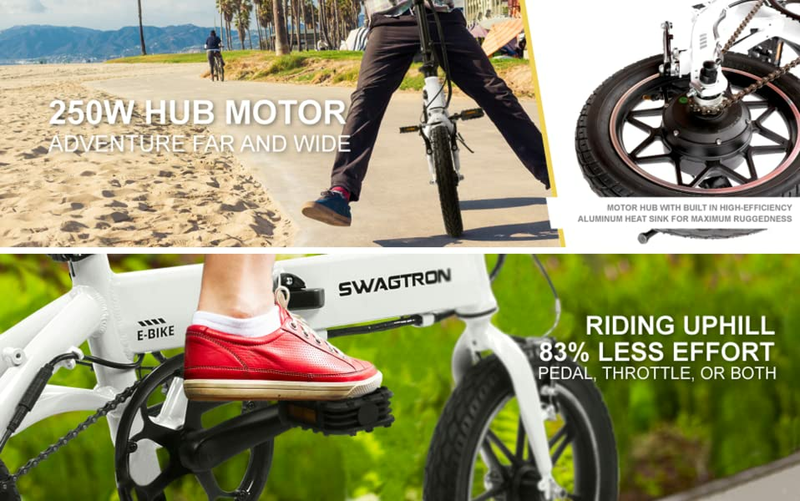 With SWAGTRON, get the best in mens bikes, ladies bikes, and so much more. Turn on the power and twist the throttle to engage the e-bike’s power assist mode. This mode makes the EB-5 a great commuter bike that’s sure to add an extra boost to expedite your daily commutes, especially for those uphill struggles. This way, you can get your heart pumping as you pedal to work and then use the throttle to cruise your way back home. 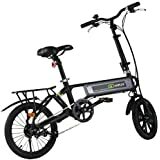 Plus, with a rechargeable li-ion battery, traverse up to 15.5 miles of blissful commutes and adventures on power alone then pedal for even more distance. Use one after the other to extend your travel distance or even use both at intervals for a new way to exercise. Ride the EB-5 electric scooter bike any way you want! 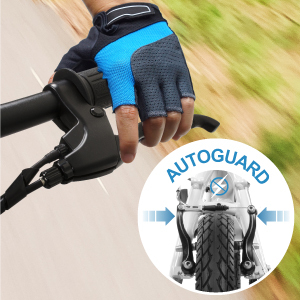 Ride knowing your electronic bike can stop on a dime thanks to special Autoguard technology. Autoguard is a safety feature that ensures the motor automatically disengages upon braking. Even if you’re holding the throttle and a surprise obstacle comes in view, rest assured you’ll have the immediate, effective stopping power as soon as you hit the brakes. Features quick-disconnect power lines that are fully removable for quick and easy maintenance. Taking your e bike to the shop to change out the tires or just for general maintenance will be a breeze! Why leave your precious cargo locked outside on the streets when you can safely tuck it under your desk? 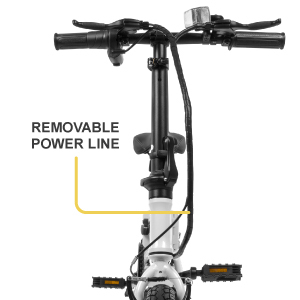 Simply collapse its stem, bend its frame, and fold its pedals to stow your foldable bike in any compact space. 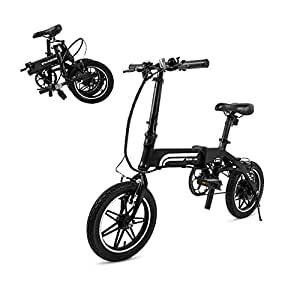 Whether you live in a third story apartment or run on a tight schedule, the EB-5 folding bike can fit perfectly in. 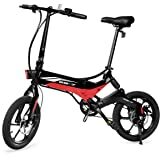 1) the Addmotor Hithot H1- for me, I am 5'11'' and this is perfect size for taller people. 2) the Genze Series 200 16-inch frame step through- for my 5'5'' wife. 3) the Swagcycle EB-6- for my 11 yo son. 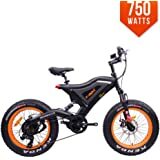 Perfect electric mountain bike for kids and about the only electric pedal bike I could find specifically designed for kids. 4) And finally the Swagcycle EB-5- which is this bike you are looking at for purchase. Of all the bikes mentioned above the most versatile in fitting all the different size bodies in my family is this EB-5. It is amazing in that I can easily adjust the seat & handle bar up to fit my 5'11' long legged body type and it still looks like I can adjust the seat even higher. I can ride it very comfortably without feeling awkward at all. As if it was a bike designed for someone my height. 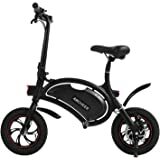 And it is the only electric bike that I can adjust all the way down in height so that it fits my 9 yo daughter (she is 45th percentile for height and weight for her age). The seat and handle bar goes down far enough where she can stand comfortably. I must say that at first I noticed the pedaling for her seemed awkward, like if she had to bend her knees way too much and I thought perhaps its because the pedals have a bigger adult diameter. But I simply put the seat height up a little so that she has to stand on her tip toes now while on the seat and now her knees look pretty normal while peddling. Not to mention her knees looked super bent on her normal bike too, I guess I had not noticed that before and the bike shop says that is normal for little kids. So basically this bike fits my 4ft 7in and 60 pound daughter and my 5ft 11in 180 pound body, and anywhere in between. It felt like a normal bike to me, no compromise in how it feels geometrically as a bike for me. I asked my little daughter the same question and she said the same "no it does not feel funny, it just feels like a normal bike. Just like my other bike." I have no idea how Swagtron accomplished this versatility but they did. This EB-5 is powerful. I live on a hill and it easily brings by 180 pound body up the hill. I also saw a youtube review where it easily handled a 260 pound guy, which is the upper limit of recommended weight for this bike. It is so powerful that my little 9 yo daughter & 11 yo son have to be careful while on it. I think my daughters little 60 pound body does not put enough weight stress on the bike so that it takes off like a damn rocket. It explodes when she hits the throttle or uses the pedal assist. You just have to supervise them the first few times so that they are aware of its power and get used to it. If not, I can easily see how an accident might happen. This is especially true with the pedal assist. When they pedal even a little to go slowly, if the pedal assist it is on then it explodes them forward like a rocket. What I have done to solve this is that she can never have the power on when they first start on the bike. I first have her ride a little to gain speed and then she is allowed to turn on the power. If you do it this way then there should be no accident. It is reasonably quick. About 10 to 15 mph depending if its riding my heavier body or my super light children. 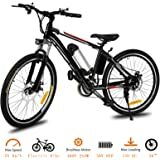 It is also an extremely light electric bike. 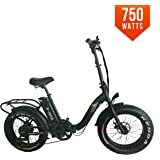 My other electric bikes are 50 to 70 pounds. Yet this weighs no more than a regular 20 wheel inch bmx bike. The one and only downfall of the bike is that it does not have an adjustable pedal assist. It is either on or it is off. There is no in between. For example, my Addmotor bike has 5 different levels of assist, from helping just a little at level 1, to going full throttle at level 5. But in fairness my Addmotor bike costs $1500 dollars, three times more than this EB-5 with only 1 level assist. The swagcycle seems to go at about 80 to 90% power with the pedal assist on and there is no turning it down. So it helps a little too much when going up hills. I wanted it to just help a little so that my daughter still got a good level of exercise. But that is not possible. The only other negative is that without the pedal assist the pedaling seems a little tougher than a regular bmx bike. Not terrible, but a little tougher. 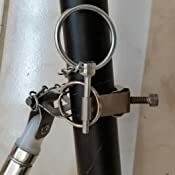 As if they do not have the perfect chain length to pedal ring ratio, which should be easy for them to fix and to have thought about before producing this bike. Another negative is if you turn off the pedal assist then you turn off the ability to just use the throttle. Since it does not have a multilevel pedal assist, at a minimum I wish the pedal assist could be turned off but then we could just use the throttle when we needed it. But it does not do that, either the pedal assist and throttle are both on, or they are both off. 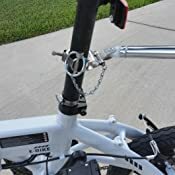 Swagtron should at least fix this, which would be easy without having to provide the more expensive multilevel pedal assist. Simple have the pedal assist on or off separate from the throttle would be my advice. But in the end, for the $499 price I paid for it then it is easily a 5 out of 5 star. 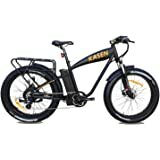 Especially since it seems to be one of the only quality electric bikes that could fit my 9 yo daughter. 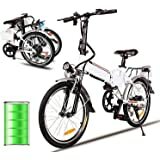 I bought another 2 of them as gifts off the Swagtron website cheaper by $20 with a coupon code. The entire family enjoys biking now on the bike routes with tons of hills, we are exercising more and getting healthier. Where as before they refused to go biking due to the difficult of the hills. So get this bike, it helps defeating family TV watching, helps getting entire family outside to exercise. 4.0 out of 5 starsDecent bike but doesn't feel sturdy. I paid 499 dollars for this and when I got it, the back tire was flat and ruptured. 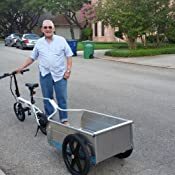 I tried to get in contact with Swagtron people but they were like "oh, well, the item is out of stock... Just send it back to us and we'll see what we can do." Eh.. I instead took it to my local bike shop and the guy fixed the tire for 14 bucks. Got it back in 30 minutes. When I finally had the ability drive this thing in my city, it feels fantastic, you're cruising easily. But the minute it starts going up a hill, you also gotta peddle to help it go up. Which is okay because the little engine helps a lot so you're not straining yourself. But, being that the wheels are so small, after a while, you feel your legs get swore. I guess the size of the wheel has a lot to do with how hard you peddle. I've driven it up to 7 miles on a single charge and it still works but you start noticing the lack of power and acceleration. But once you charge it right back up, the bike works pretty good. Folding it is rather easy, it's surprising how it fits perfectly well in my car's trunk. 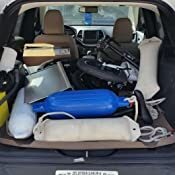 But make sure you find something that holds it in there because it just flops and bounces around in your car's trunk if you don't tie it down. Overall, the bike is nice but after that punctured tire dilemma it made me realize how fragile this bike is. The brakes on the steering wheel also started getting loose after a while, so I feel like you gotta keep up in checking it, maintaining it and see if everything is good. Plus, buy some zip ties, all those lose wires sometimes they get in the way when you're peddling. Would I buy it again? I don't know. I'll let you know after 6 months. Let's see how fragile this bike really is after months of usage. 4.0 out of 5 starsPedaling is almost impossible without the battery. Be warned - if the battery dies, you are screwed! 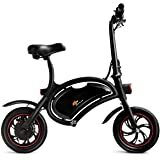 This thing might look like a bicycle, but it's a scooter. The pedals are primarily for hill assistance. It's almost impossible to pedal unless you're on a flat surface, and even then it takes quite a bit of effort to get it going.It has a fixed chain, so no changing gears. It's great for what it is. It rides well and I'm very happy with it overall, but not being able to use it if the battery dies is a big design flaw.